The USSR Congress of People’s Deputies, elected in the spring of 1989, was to play the role of the country’s supreme legislative body. This superparliament, comprised of 2,250 deputies, was to be convened twice a year to discuss and settle most important constitutional issues. The Congress in its turn elected out of its deputies a smaller sitting parliament, the Supreme Soviet, which was to carry on the day-to-day legislative work between the sessions of Congress. The sittings of the First Congress, televised across the country, unedited and full of political struggle, were an incredible spectacle for the Soviet people. The entire country stopped working and followed its proceedings on radio and television. The newly elected parliament also saw the formation for the first time in Soviet history of parliamentary opposition, the Interregional Group of Deputies. It consisted of democratically and liberally inclined intellectuals and politicians, including Boris Yeltsin and Andrei Sakharov. The latter entered parliament as a representative of the USSR Academy of Sciences and quickly emerged as the main ideologist and moral leader of the democratic opposition. His intellectual and political debate with Gorbachev and the Communist majority on the floor of Congress became the main source of political controversy throughout its sittings. It resulted in a dramatic split of the supporters of perestroika into moderates led by Gorbachev and radicals united in the Interregional Group of Deputies. From now on Gorbachev ceased to be the single leader of the reform process. He now had to contend with political rivals who offered alternative reform strategies and whose support in society was growing. It is likely that Gorbachev’s personal dislike of Yeltsin colored his attitude toward radical democrats as a group. The schism between Gorbachev and the radicals continued to widen throughout the rest of 1989. The radicals had the support of a number of influential national media outlets and were successful in popularizing their political agenda on national TV. On the whole, their demands remained within the ideological confines of democratic socialism, but the emphasis was now increasingly made on dismantling the authoritarian unitary state. Sakharov, for instance, drafted a new union treaty, which envisaged a loose constitutional structure, uniting the republics more on the principles of a confederation rather than a federation. By 1990 the radical democrats competed vigorously for power with Gorbachev. In the autumn of 1989 their cause received a powerful impulse from the revolutions that swept across Eastern Europe, leading to the collapse of the Communist regimes there. At the Second Congress of People’s Deputies in December 1989 the radicals even made open hints that Gorbachev himself might share the lot of Erich Honecker and Nicolae Ceausescu unless he moved quickly to implement radical reform. 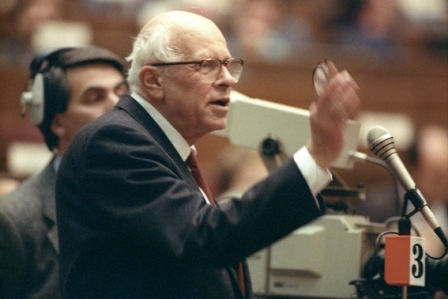 With the sudden death of Sakharov at the end of 1989, Yeltsin became the unquestionable leader of the radical opposition.